You need to find a good breakfast joint close to anywhere you live, so I set out to start exploring in my hood. First up, I went to Le Petit Beaujolais. Now there are two of these "Beaujolais" places on opposite sides of Colorado. I'm referring to the one on the North side. 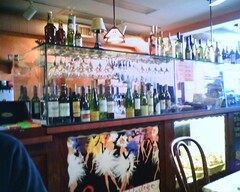 The decor is a french cafe scene with French posters hung all over. The display cases in front full of fresh breads and pasteries. Promising. But I just had a jammin croissant at Cafe Los Feliz the other day. So instead of going for coffee and pasteries, I figured I would order something standard to do a comparison of various breakfast joints. I ordered a latte and the ham and eggs. The latte hit the spot. The ham was 2 slices of thick ham that was grilled. Not bad. However, I was disappointed with skimpy portions of potatoes and they were skimpy on taste. The scrambled eggs were standard. This didn't "wow" me but didn't scare me away. Next time, I'll pick another dish - probably an omlette. I'll also check out the lunch scene - it looks like they may have some good sandwiches/salads. This place is starting to be open for dinners a few nights a week and they look to have some wines too. May have to walk over here for dinner and try some dishes and stumble home. the eggs benedict here is the best.